Well, I am about to embark on a couple of trips that are also a project in process, my shakedown cruise in the 27 foot Mallard 265H I bought back in February. I tried to think of a cute name for the thing, but cute isn't easy for me. Steinbeck called his Rocinante, after Don Quixote's famous steed. I have settled on Dapple, after Sancho Panza's mule. I figured a little humility was in order. I'm not quixotic enough to think myself a Steinbeck. 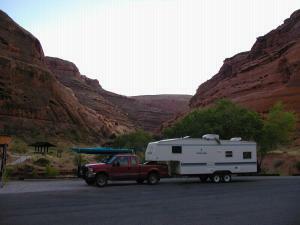 I sought and followed a variety of advice on the Web, both in the rec.outdoors.rv-travel newsgroup and elsewhere. I installed a Honda EU1000i generator, 4 golf-cart batteries, assorted shelves and fluorescent lights, a couple of 400W inverters, a TV (shudder), and an expansion tank in the plumbing. I put in a CD player, and downloaded most of the corpus of Project Gutenberg for rainy day reading. I fashioned a rack for my Kayak. I got a Dell laptop, and a Verizon cell phone to keep in touch. I bought an F250 V10 to pull the whole mess. 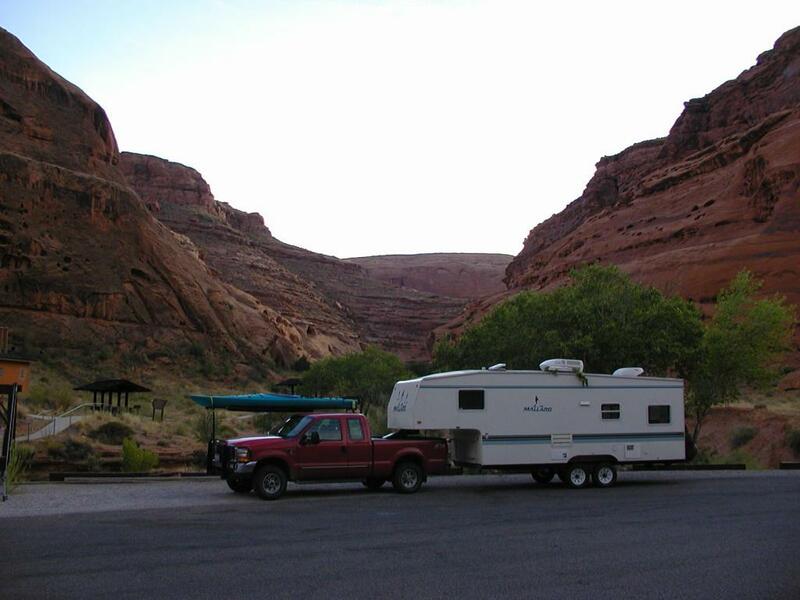 In short, I set myself up as the very model of a modern RV traveler, at least of the modest sort, a dozen ranks below the Road Behemoths favored by all you rock stars and movie moguls. Like Humpty Dumpty, I expect a great fall. Or at least a great summer. Sounds like this guy was pretty sure what he was doing, doesn't it? But I figured the only way to make it work was to just do it. I spent July in the Pacific Northwest, drove thousands of miles, but wrote little or nothing about it. There wasn't time. I was moving every day. So when September rolled around, I took off for High Colorado. And this time I was determined to stay put. Maybe if I didn't move, the world would catch up to me.